What do you get when you combine sugar mill parts, a tactical nightmare and Seabee ingenuity? Now don’t be scared the doodlebug is not an actual bug, lay down the pesticides. 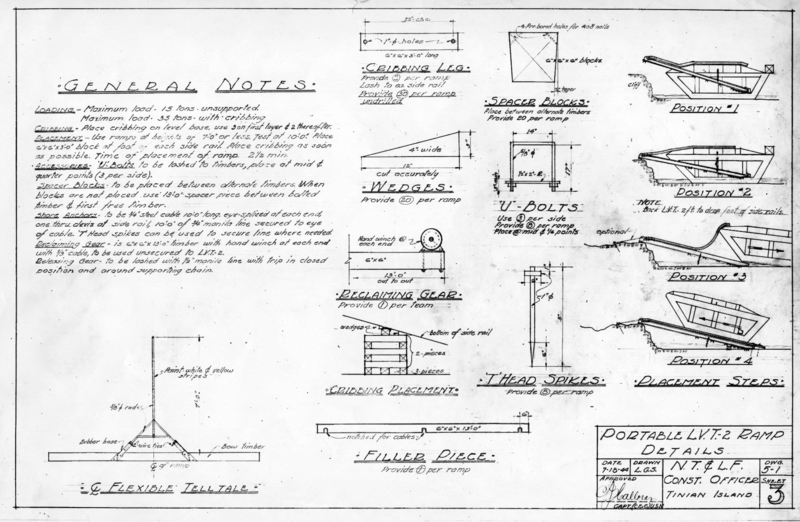 The Doodlebug was one of the “secret weapons” attributed to helping the Seabees overcome the supposed impassable coral cliffs of Tinian during World War II. Tinian, located in the Mariana Islands near Guam, is an island with two small pinhead beaches guarded by the Japanese during WWII. The rest of the water line was marked by jagged coral cliffs ranging up to 15 feet high. This was not a pleasant picture for the tactical experts on Saipan planning the Tinian invasion. Senior leadership decided that in order to gain control of the island, the cliffs would have to be scaled. The problem of how to overcome this natural obstacle was given to Capt. Paul Halloran, commander of the Seabees. Halloran set about designing and implementing a Land Vehicle, Tracked (LVT) using surplus materials from a Japanese sugar mill on the island, naming it the Doodlebug. A mere 54 hours elapsed between original conception and the first test! Capt. Paul Halloran’s Doodlebug concept. The reason why the Doodlebug worked was that it carried its own ladder with which to scale the cliffs. Four CEC officers and 30 Seabees joined the assault waves on Tinian, scouting the shoreline for points of landings on the cliffs. Once those points were identified, the Doodlebugs moved in with their tracks gripping the sand to hold them close to the cliff-side. Hooks caught on the cliff-tops and the Doodlebugs were reversed. As they backed out from under the ramps, one end of the ramp would fall into the water to rest on the coral bottoms. Ramp crews leaped out to determine if the ramps were firmly anchored. Once secured, the Doodlebugs rumbled up out of the water and over the cliffs. 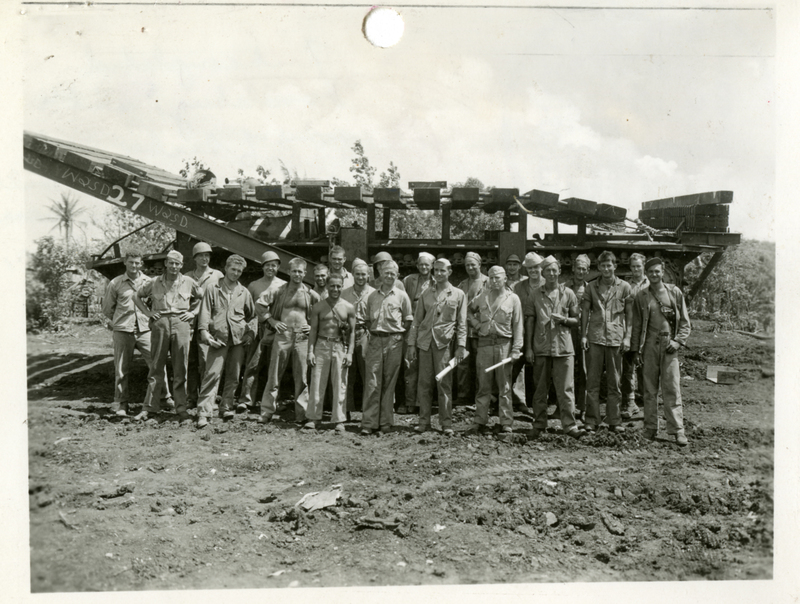 Seabees remained to maintain the ramps and to assist in building the access roads to them. 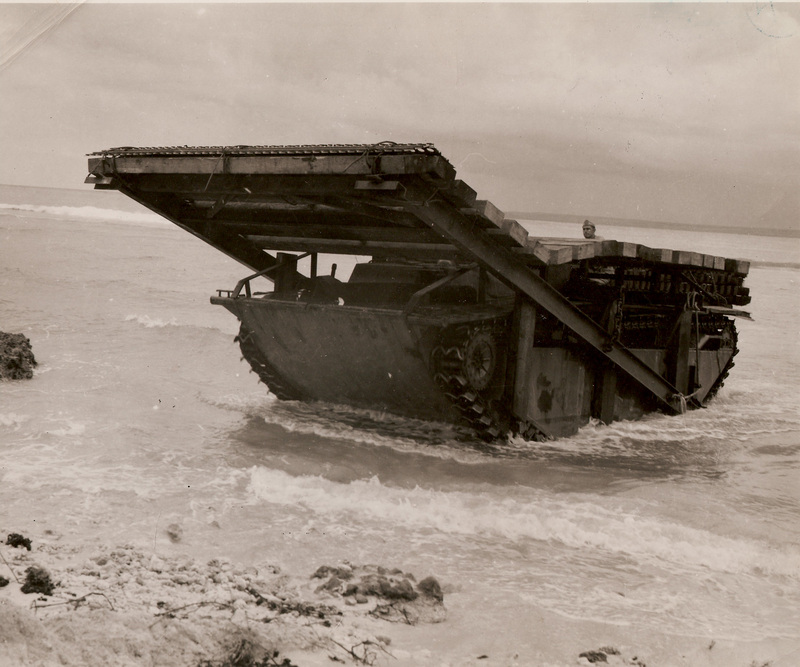 As the ramps were put into place and made ready, a flow of amphibious equipment “walked” up the coral barriers behind them. Soon a steady stream of American motorized might was pouring onto the island spreading out and driving the already frustrated Japanese defenders back from their beach positions. This tactical advantage helped the Marines capture the beachhead and soon after, Tinian was under American control. The Doodlebugs were so successful they were required for only a short period of time. Proving that when faced with cliffs of despair all you need is a little sugar and a little skill, something of which the Seabees on Tinian had plenty! U.S. Navy Seabee Museum patrons are invited to a special tour event, “The Seabee Attic: Behind the Scenes of the USNSM Collection,” where they will get an extended glimpse of the archive facility April 4 with the first tour beginning at 12 p.m. and the second at 1:30 p.m.
Museum curators Kim Crowell and Robyn King will take visitors into the archive facility to view the vast collection of documents and artifacts not currently displayed on the museum floor. Tours will be limited to approximately 15 people per tour. Those interested are instructed to contact the museum’s front desk to reserve a spot at (805) 982-5165. The tour event is part of the monthly free public education program that launched in February which presents a variety of topics to include Seabee history and museum operations. Dr. Lara Godbille, museum director, explained the collection storage facility tour is way of showing the community how much work goes into maintaining the collection. 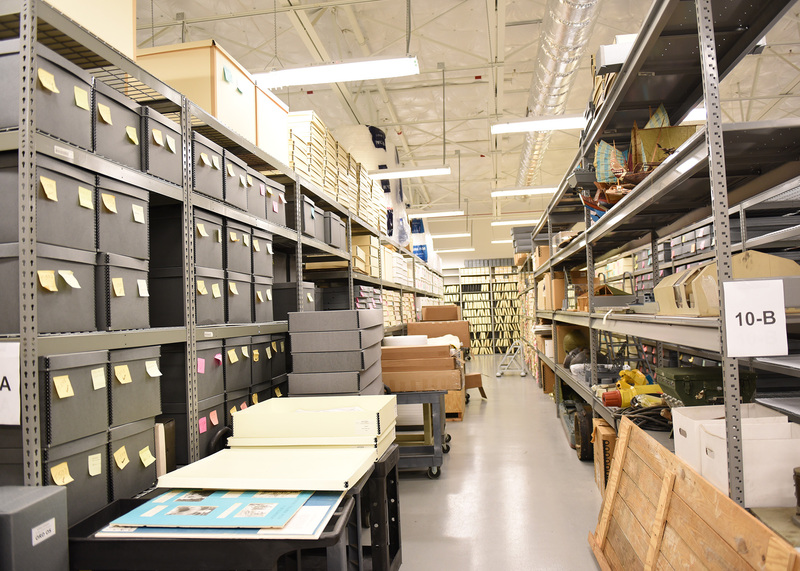 The U.S. Navy Seabee Museum works to select, collect, preserve and display historic material relating to the history of the Naval Construction Force, better known as the Seabees, and the U.S. Navy Civil Engineer Corps. The second oldest of the official Navy museums, the Seabee Museum was established in 1947 in Port Hueneme, California, which today is part of Naval Base Ventura County (NBVC). Section of Marston Matting in the U.S. Navy Seabee Museum Collection. Have you ever enjoyed a day at the beach having to carry your chair, umbrella, and cooler; only to struggle with dragging your cooler across the sand because the wheels are digging in? On a much larger scale, this was a major dilemma for the Seabees when it came to their ship-to-shore responsibilities of getting troops, their equipment, and vehicles off ships, across pontoon causeways, and on to a beach. This concept is also known as an amphibious landing. 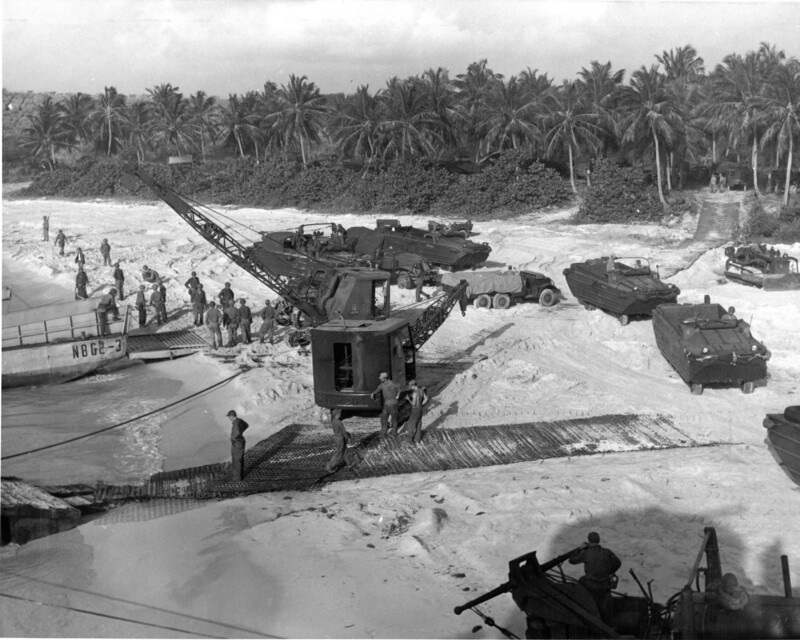 The ability to move heavy vehicles and equipment across the short distance from a landing craft ramp or pontoon causeway to solid ground was crucial to the success or failure of a landing force in gaining a foothold on the enemy shore. 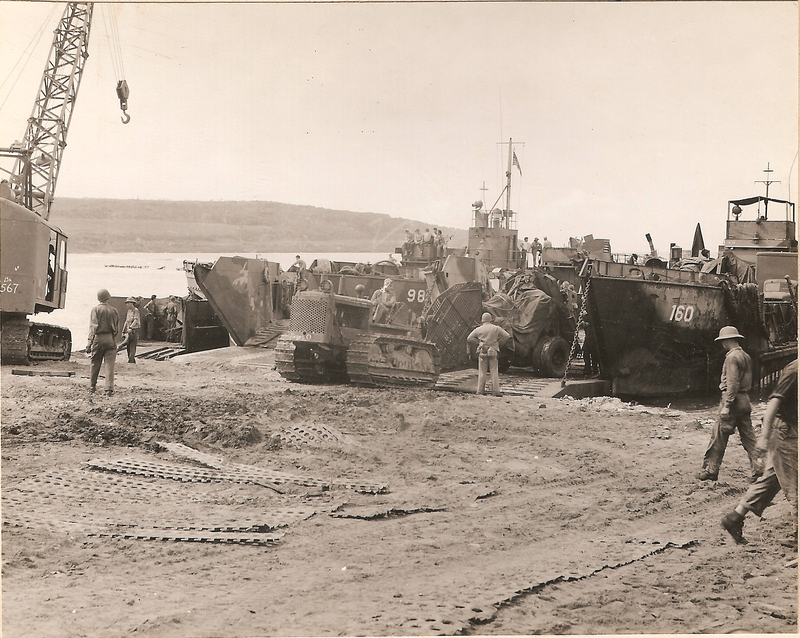 One of the complications connected with amphibious landings during WWII involved moving heavy equipment across mushy beach sand. Tires mired in and cut deep ruts in the sand, stalling equipment and making some exits from the beach impassable. Two amphibious vehicles- the amphibious tractor and the DUKW (also known as a “Duck”) were designed to overcome these complications, and were relatively successful. But even equipment with sufficient traction to plow through the soft, spongy earth was slowed down, greatly increasing the time required to get supplies ashore. The question came down to this: How to achieve a hard beach surface in minimum time, at minimum cost, with minimum equipment and personnel, and with material which would not be in critically short supply during war time? One of the creations during the war to overcome this obstacle was called Marston Matting, also known as Pierced Steel Planking or PSP. 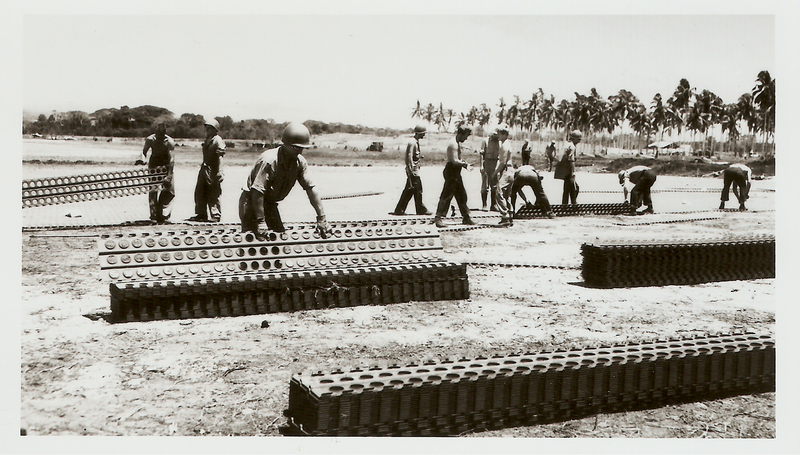 It became the standard steel matting utilized by the Seabees to construct not only sand beach landings, but also to build airfields and temporary roads. It got its name from the town of Marston, NC where the invention, by a Pittsburgh steel specialty engineer named Gerald G. Greulich, was tested. Marston Matting had many advantages. A single piece measured 10 feet long and 15 inches wide. 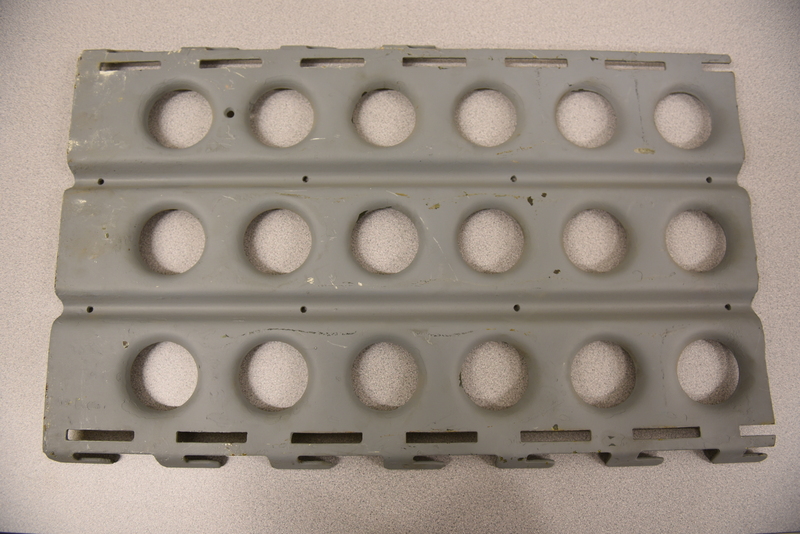 The hole pattern for the sheets was 3 holes wide by 29 holes long resulting in 87 holes per plate. The circular holes allowed the planking to be laid on top of a surface that has been roughly graded. Marston Matting allowed rapid construction; it was pre-fabricated and fit together quickly. It was lighter and required less cargo space than other matting, and could be used in all-weather conditions because it was highly resistant to corrosion. Seabees were fond of Marston Matting because it enabled them to do their jobs quickly and efficiently. Often, Seabees were subject to enemy fire while laying down the matting. The benefits of using this matting were substantial when in the course of it being subject to enemy fire and destroyed as a result, the sectional matting could be quickly replaced. The creation of Marston Matting helped the Allies transport their equipment faster from ship-to-shore, build roads on any terrain necessary and fastened together quickly to construct airstrips. It gave the Allies an advantage in Normandy on Omaha Beach, and throughout the Pacific Theater. Marston Matting helped win the war. Robyn King earned her Bachelors in History and Anthropology from the State University of New York at Oneonta. She has experience working at State Museums, Historic Sites, the National Parks Service, and most recently the Navy. She’s an expert in collection management, and has worked closely with both natural and cultural collections. Robyn loves all museums and sharing her love of history. When’s she not working, she’s volunteering her time with the National Peace Corps Association, as a Returned Peace Corps Volunteer from West Africa. We offer our final entry into Our Cultural Expanse: Women in the Navy. Today’s Navy is full of opportunity for women, whose force currently stands at 68,000 active and reserve members. The final restrictions of women serving in combat were removed in 2013 by then Secretary of Defense Leon Panetta. Adm. Michelle Howard is currently serving as the first female Vice Chief of Naval Operations and first female four-star admiral. Rear Adm. Katherine Gregory is serving as the first female chief of the Civil Engineer Corps and the commander for Naval Facilities Engineering Command (NAVFAC). And as of January of this year, the Navy began accepting applications for enlisted women to serve on submarines. Previously, only female officers had begun being integrated into the community in 2010. Whether on land, at sea, underwater, or in the skies above, no job in the Navy, at peace or war, will be limited to a certain gender. The Navy has worked through the barriers of the past to ensure equal opportunity for ALL service members. 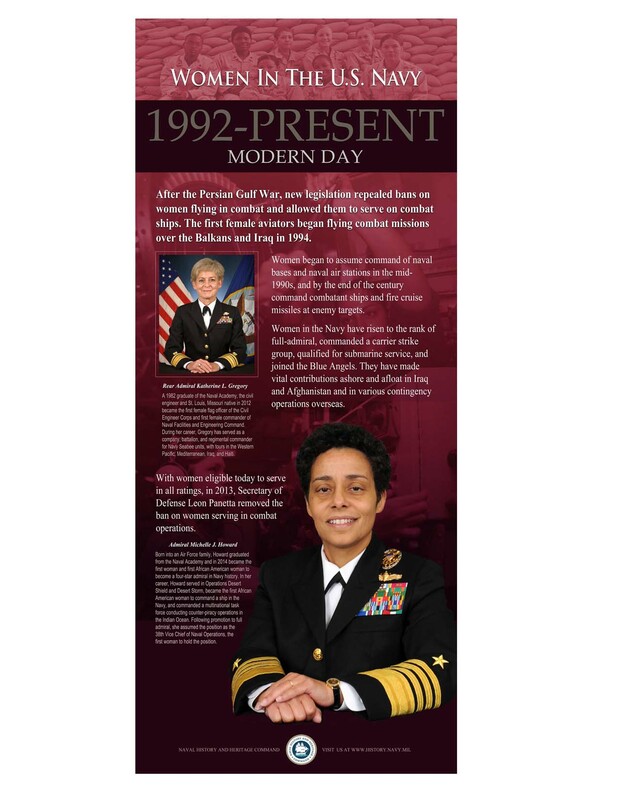 Explore our parent command, Naval History and Heritage Command‘s historical presentation: Women in the Navy. 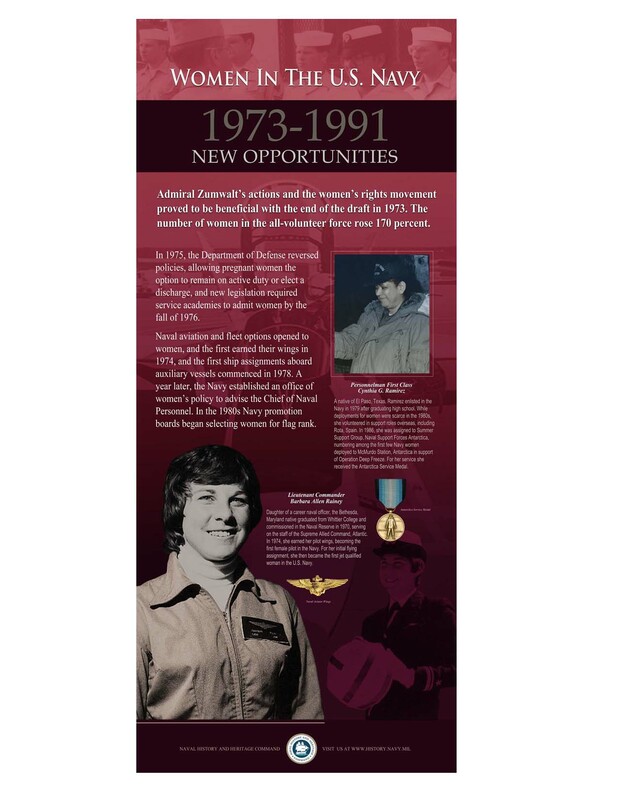 For non-military presentations, visit the official website for Woman’s History Month. Our Cultural Expanse will continue in May as we present similar graphical presentations honoring Asian and Pacific Islander Heritage Month. Admiral Elmo Russell Zumwalt, Jr., Chief of Naval Operations in the 1970s, pushed forward on his women and minority initiatives that increased opportunities for female Sailors. The surface and aviation communities saw the biggest strides when women were allowed to serve on auxiliary vessels, earn their flight wings, and be eligible for flag rank. Women were also finding other ways to contribute in the absence of deployment opportunities, such as serving in overseas support departments and even support roles in Antarctica. In the 1960s and early 1970s, opportunities for women in the Navy were expanding, but they weren’t quite fully accepted yet. There existed a restriction on women leading men, but President Johnson signed legislation that allowed them to become flag officers that ultimately led to the removal of that restriction. The Seabee community also saw the first women being integrated, the first of which was Constructionman Camella Jones. Most other communities opened up opportunities for women including aviation, Chaplain Corps, and Civil Engineer Corps, among others. If you could not make it to the museum last weekend to catch our presentation, “Preserving Your Vital Records: Expert Advice From Federal Archivists,” we’ve got you covered. The video is embedded below from our YouTube channel. 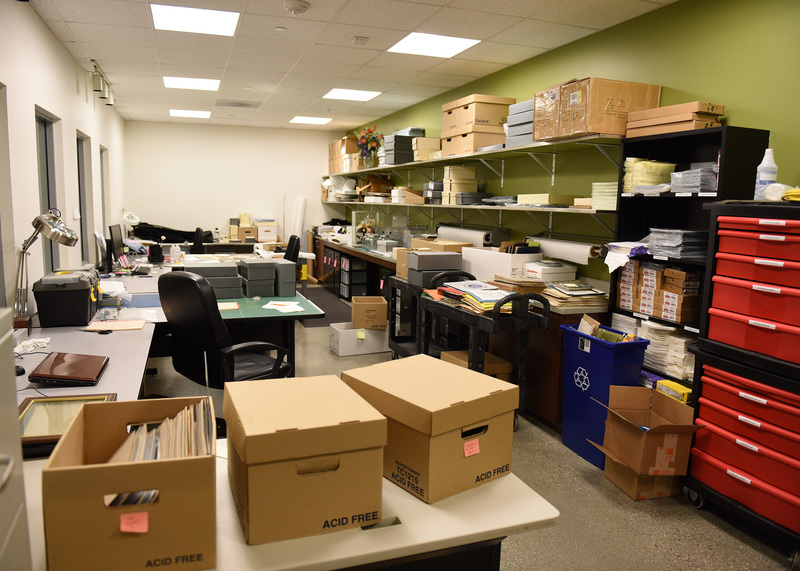 Archivist Ingi House explains how you can create a simple and effective records management system, which is perfect for tax season! Ingi House is originally from Kansas where she got her B.A. in history from K.U. and M.L.S. from E.S.U. After working for the Dole Institute of Politics she moved to the East Coast. 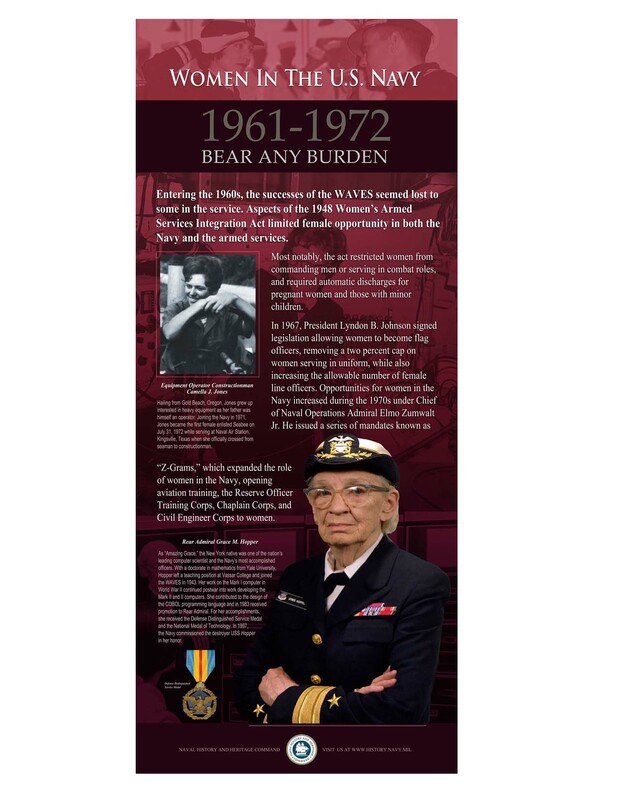 In D.C. she worked at the National Archives and Records Admiration and then at the Defense Acquisition University where she became a Certified Archivist. 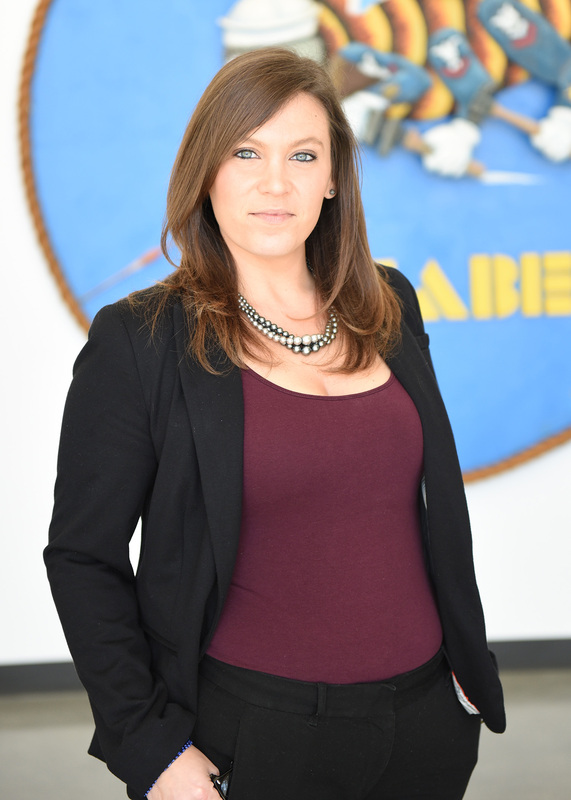 Her continued enjoyment of military history lead her to switching coasts and coming to work for the Seabee Museum where she is collection manager for the archives and records manager liaison.